Music From Japan celebrated its 27th season of presenting Japanese music to American audiences. Festival 2002 was marked by the organization’s first endeavor in the South. The North American tour of Ensemble Harena, presented in association with The Japan Federation of Composers, opened in Tennessee at the Middle Tennessee State University. Our Festival New York featured the work of composer Akira Nishimura, including a newly commissioned 90-minute piano work premiered by the virtuosic Aki Takahashi. The January 31 concert and lecture in Fukushima opened Music From Japan Festival 2002. Ambassador Hisashi Owada, formerly with the Japanese Mission to the United Nations, gave a lecture on “Music and International Exchange” to a capacity audience at the Fukushima Ongaku-do. Among the audience members were the Mayor and the Governor of Fukushima. Ensemble Harena performed classical gagaku and previewed Kikuko Massumoto’s Divertimento, commissioned by MFJ for Festival 2002. Ms. Massumoto gave a short background on gagaku and made comments on her own piece. A warm reception with the artists followed at the Koseki Yuji Memorial Hall. The U.S. portion of Music From Japan Festival 2002 opened on February 5 as Ensemble Harena performed at the Wright Music Hall, Middle Tennessee State University to a full house. The five members delighted the crowd by pairing bugaku, traditional court dance in vivid vintage costumes, with the high-pitched, celebratory gagaku music of the Japanese imperial court. Audience members were given the chance to participate in the singing to fully experience the unique style of music. 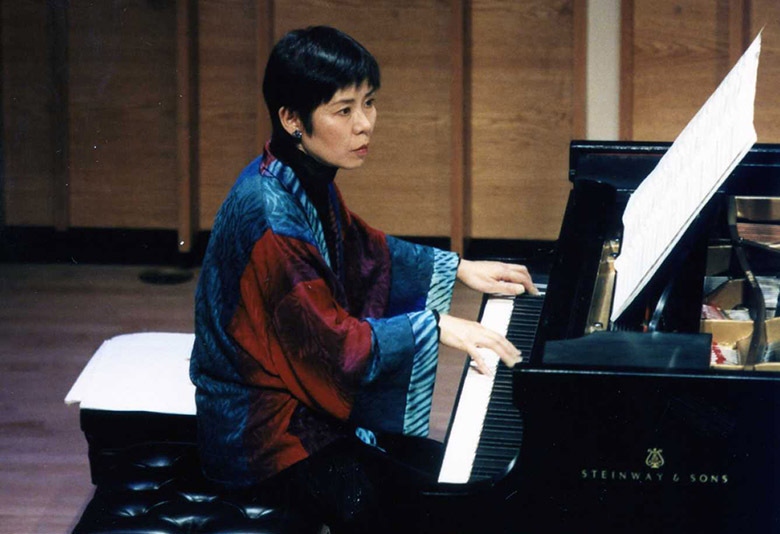 The performance marked the premiere of Kikuko Massumoto’s Music From Japan commissioned work, “Divertimento.” Other works on the program included Maki Ishii’s Hiten Seido I and Sukeyasu Shiba’s Bankaso from Sho-so-in Tenpyo Biwa-Fu. In conjunction with the performance, a lecture-demonstration was held by Ensemble Harena on February 4 with Sharon Nakazato, lecturer. “The Works of Akira Nishimura” on February 9 at Merkin Concert Hall at the Abraham Goodman House marked the premiere of the celebrated composer’s 90-minute piano work Avatars, performed by Aki Takahashi. Allan Kozinn of The New York Times hailed the performance as “a magnificent picturesque suite — imagine a hybrid of Mussorgsky’s ‘Pictures at an Exhibition,’ Messiaen’s ‘Vingt Regards sur l’Enfant Jesus’ and Liszt’s ‘Transcendental Etudes,’ but with Mr. Nishimura’s signature moves always in full view. Ms. Takahashi gave the piece an energetic and, it seemed, perfectly paced performance.” Other works featured that night were Pipa for three guitars and String Quartet No. 2, Pulses of Light. Mr. Nishimura gave a pre-concert lecture on his own background and interests leading up to the Music From Japan commission of Avatars. On February 10, Ensemble Harena’s Gagaku Concert was preceded by an introduction on gagaku and its Chinese Tang Dynasty origins given by Sharon Nakazato. The featured works in the program were Divertimento and Bankaso, with the new addition of Toshio Nakagawa’s Flexa. Later that afternoon, the symposium “Gagaku and Japanese Music from the Pan-Asian Perspective” showcased a discussion between Mr. Nishimura, Ms. Takahashi, and two members of Ensemble Harena, Ms. Nakamura and Ms. Tono, moderated by Ms. Nakazato. Ms. Takahashi gave a special performance of Mr. Nishimura’s “Silence and Light” in tribute to the distinguished musicologist and critic, the late Kuniharu Akiyama. February 12 brought the final performance for Ensemble Harena’s North American Tour with a stop in Canada. Music From Japan presented the gagaku concert program along with a pre-concert workshop. The haunting, shrill notes of the ancient gagaku instruments resonated through The Music Gallery at St. George, concluding Music From Japan Festival 2002.